We should not allow ourselves to hurry past this point, because it is of tremendous importance in relation to the problems we outlined in the first three chapters of this book. Knowing what is right and wrong, we have a way to have order and freedom simultaneously. It is relatively easy to attain order in society and not have any freedom. There are plenty of examples of that today. Likewise, it is easy to practice freedom without any order. There are examples of that, too, in the Western societies most of us live in. But how do we get both together? That is the problem. The Bible gives a world-view that provides order and yet at the same time freedom. God’s rules are like a perimeter fence. We must stay within that fence if we are to avoid getting messed up. But inside the fence we have an almost endless variety of possibilities for freedom. These touch every area of human life. A good example is the pursuit of science. The Christian world-view gives us a base for science, yet (since we are made in the image of God) a freedom to pursue science. The birth of modern science is generally conceded to be heavily indebted to the Christian world-view. The Bible tells us that the universe is ordered, because God made it to cohere in all sorts of amazing ways. At the same time it tells us that we are persons. We are able to know what is around us; the subject can know the object. It may seem rather obvious to say we can know what is around us, for everyone lives like this, day in and day out. We drive the car, use the stove, and so forth. Even though we cannot completely know any single detail of what is around us, we can still have accurate knowledge. This is what makes science possible, too. But, for the materialistic philosophers, this is still a problem. Why is it that the noises we make from our mouths, for example, “cat,” “dog,” “glass,” “hand,” have a correspondence with objects in the outside world? That is the problem with which modern philosophers are still struggling. But within the Christian view the answer is simple and obvious: the world was made that way in the first place. Without the Bible’s answer of a personal God who had made the universe – and at the same time persons within it to have relationship with what has been made – people can still know the objects, but they do not know why they can know them. Francis Schaeffer (1912–1984) was in many ways a man before his time. Schaeffer’s work, while directed to Christians, “A Christian Manifesto” warrants the attention of those who simply seek an oft overlooked fact in our nation’s founding. Schaeffer’s thesis is that Christians in the 20th century viewed life and spirituality in “bits and pieces instead of totals.” Schaeffer constructs the book around this thesis that Christians need to become aware of the true problem and to respond in a holistic manner. Schaeffer begins with a stinging description of the problem. Christians too often focus on surface-level cultural problems. Ironically, one of the causes of the problem according to Schaeffer is Pietism. Pietism began in the 17th century in reaction to formalism in the church. Pietism stressed devotion to God and engaging in spiritual disciplines companied by observing high moral standards. Schaeffer suggests that “platonic spirituality” corrupted Pietism by creating a division between the spiritual and material world. Life was divided into spiritual and natural parts. Schaeffer argues that “true spirituality covers all of reality”. Christianity is not a collection of truths, but total truth. The truth of Christianity applied to all aspects of life from spiritual matters to government and social policies. The Truth of Christianity offered a structure for society and a foundation for law and morality. The alternative worldview that competed with Christianity in the 20th century was naturalism or Modernism. Naturalism denied the existence of God and the existence of absolute truth offered in Christianity and through the Scriptures. Rather, reality is natural and truth was limited to the natural world. The philosophy associated with naturalism was secular humanism. “The term humanism used in the wider, more prevalent way means Man beginning with himself, with no knowledge except what he himself can discover and not standards outside of himself”. Truth varies and morality changes with the needs of society or the will of the majority. Humanism recognizes that human nature longs to be free. However, freedom only lasts within a structure that conforms to reality. The flaw of humanism is the assumption that people are not innately selfish and prone to behavior normally identified in Christianity as “sin” such as greed or control. The search for freedom that does not also include measures to restrain the natural tendencies of human nature will always succumb to oppression or some form of authoritarianism. Schaeffer begins the chapter by using the discussion of freedom in a comparison of revolutions. The American Revolution and the “Bloodless” Revolution in Britain (1688) were based on the idea that absolute law exists and that all people are subject to that law including rulers. This view was called Lex Rex or “the law is king.” The Lex Rex concept grew out of the Protestant Reformation and the belief that God had revealed absolute law that applies to all people and to aspects of life and that these laws will apply throughout history. The humanist approach to revolution was demonstrated in France and Russia. The French Revolution (1789 – 1799) attempted to build society on humanistic idealism and the will of the majority. The problem was humanistic idealism has no reliable foundation. What one group defines is true may be rejected by another group and its version of truth. Such was the case in France when chaos ensued and thousands of French citizens were executed in the process of multiple temporary governments coming to power. All failed until the French followed the humanistic pattern of turning to an authoritarian government under Napoleon in hopes of restoring peace. The Russians fared no better. The Bolshevik Revolution (1917) had only a humanistic foundation on which to base the revolt against the Czars. However, the foundation was insufficient when different factions fought over control of the Russian government and chaos was the result. Peace was restored when the people turned to the Communist Party for assistance. The Communist Party under Stalin and Lenin imposed peace on Russia through force and at times the executions of their political enemies. Schaeffer suggests that our country abandoned its devotion to Lex Rex in the wake of the widespread social acceptance of Secular Humanism. The nature of laws became one of the obvious victims of this shift. Schaeffer describes humanistic law as “sociological” law because it only rests on the will of the people. The will of the people changes over time. If the legal philosophy is sociological law then laws will change to reflect the cultural mood at the time. The shift to sociological law is most evident in the rulings of the Supreme Court. The belief that the Constitution is a “living” document means that it is subject to interpretation. The rulings of the court can insert new meaning into the Constitution such as finding legal protection for abortion as a right and the separation of church and state meaning no contact. For secular humanists, the will of the majority as reflected in the rulings of courts is sufficient grounds to determine the moral implications of rulings except for those considered most egregious at that point in the cultural mood. For example, rulings that allow for the confiscation of private property under imminent domain provisions in the law in order to build retail stores. Schaeffer spends the remaining chapters offering a solution and plan of action. The first step is “Revival, Revolution, and Reform” and the call to recognize that a correct view of Christianity as applying to all of life is needed. “An Open Window” was Schaeffer’s analysis at the time that Christians still had an open window to give an accurate representation of Christianity that applied to all of life. “The Limits of Civil Obedience” and “The Use of Civil Disobedience” was Schaeffer’s look into the future should authoritarian government continue to encroach on the rights and freedoms of citizens. Schaeffer’s conclusion was that Christians will either have to compromise their beliefs and prepare to engage in civil disobedience. Picking your vantage point to get the sky as background was a masterstroke here. Jan Fabre (google that name) is quite multi-dimensional : writes and paints, is the author and director of theater plays that have moved/shocked the Festival at Avignon, makes controversial installations etc (like covering the whole ceiling of a room in the royal palace with the skeletons of a certain type of bug – I kid you not!). And his sculptures are mainly self portraits, I believe they are made as casts. 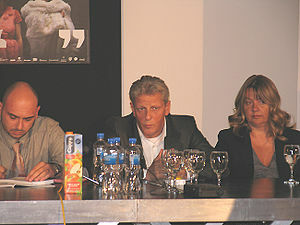 Jan Fabre (center) in 2008. He studied at the Municipal Institute of Decorative Arts and the Royal Academy of Fine Arts in Antwerp. Between 1976 and 1980 he wrote his first scripts for the theatre and made his début performances. Between 1976 en 1980 he wrote his first texts for the theatre and did his first solo performances. During his ‘money-performances’ he burned money and wrote the word ‘MONEY’ with the ashes. In 1977 he renames the street where he lives to “Jan Fabre street” and fixes a commemorative plaque “Here lives and works Jan Fabre” to the house of his parents, by analogy to the commemorative plate on the house of Vincent Van Gogh in the same street. In 1978 he makes drawings with his own blood during the solo performance ‘My body, my blood, my landscape’. In 1980 ‘The Bic-Art Room’ he had himself locked up for three days and three nights in a white cube full of objects, drawing with blue Bic ballpoint pens as an alternative to Big art Established in 1986, Troubleyn/Jan Fabre is a theatre company with extensive international operations, with its home base in Antwerp, Belgium. His decoration of the ceiling of the Royal Palace in Brussels Heaven of Delight (made out of one million six hundred thousand jewel-scarab wing cases) is widely praised. In 2004 he erected Totem, a giant bug stuck on a 70 foot steel needle, on the Ladeuzeplein in Leuven. On 26 October 2012, several media reported how during a shoot in the Antwerp town hall for a forthcoming film on Fabre, living cats were thrown repeatedly several meters spinning into the air, after which they made a hard landing on the steps of the entrance hall. Animal welfare executive chairman Luc Bungeneers said he was having a meeting with his party chairman when he heard howling cats. “To my horror, we found cats were being assaulted in the name of art” Bungeneers said. “It went on for several hours.” The filming was eventually aborted after protests from the crew’s own technicians. Later that day, Fabre claimed all cats were still in good health and it was a conspiracy of the political party NVA. Mr Fabre has received 20,000 emails slamming his act. He has also been attacked seven times by men carrying clubs whilst out jogging in the park and been forced to sleep in a different location every night.Antwerp’s deputy mayor for animal wellbeing and the animal rights organisation Global Action in the Interest of Animals also launched complaints about Mr Fabre’s controversial act.